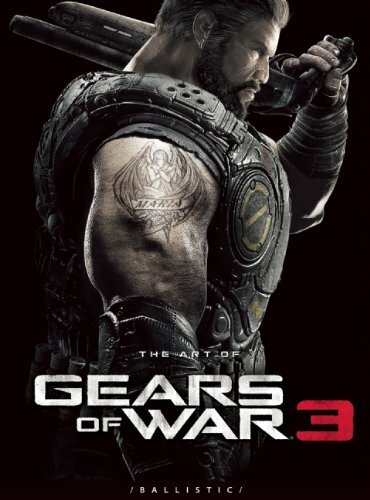 The Art of Gears of War 3 is one whopping 320-page art book. Not a lot of art books come at this size. It's incredible. The book is split into two parts, featuring the concept art and production art. There are art for characters, monsters, weapons, vehicles and environments, together with quotes on selected pieces. The concept art is amazing. They are painted with high levels of detail and look really great. Everything looks gritty real and has weight. That's the art direction of the game. The characters and monsters are bulky but always look believable. There are many variations including discarded concepts. The best ones are then chosen for production. The second half of the book shows production art version of the concept art as they are used as game assets. The high-res renders and textured mapped models are really amazing. All of them deserve to be made into collectible figures. In particular, the monster models are wicked. They are painstakingly sculpted with mind-blowing details to show all sorts of imaginable contortions. The environment art are beautiful haunting scenes of ruins and other locations, such as the grandiose interiors of Azura. The amount of art that goes into making this game is unbelievable. One thing missing is the artist credits. There must have been a lot of artists working on the game. It's a terrific book overall. Highly recommended for fans of the game, concept artists and collectors. More video games should come up with books like these. This art book is also available as special and folio editions, both available only from Ballistic Publishing website. An A3 poster comes free for the first 100 customers. Also check out the earlier video game art books from Ballistic Publishing, namely The Art of God of War III and The Art of Uncharted 2. PS. This book is a review copy provided by Ballistic Publishing. Thanks a lot! Books from Ballistic Publishing generally have good binding. @Parka: Thank you very much! Love ballistic's artbooks, hate their price. Come on, 50£ is crazy. It is a bit much. I mean, I think Udon's prices are a little high sometimes, but they've never put out anything that costs that much. is the binding hard cover or soft cover? Amazon says soft cover but I can't imagine a book of this quality and many pages to be soft cover. It's 320 pages. Amazon listed the page number wrongly.